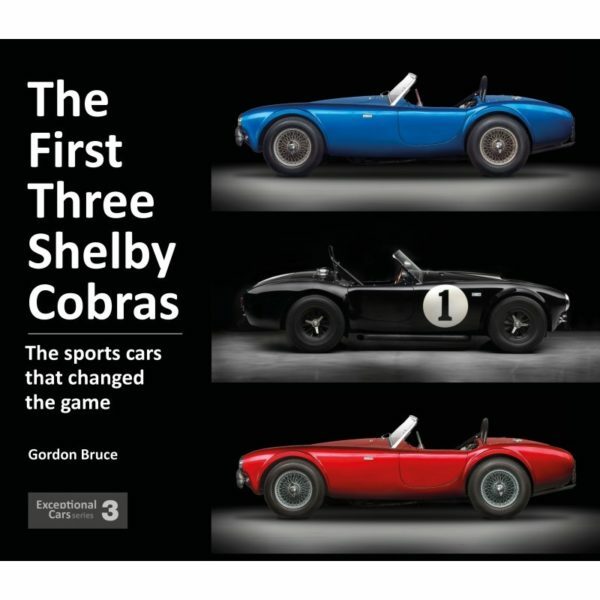 That Gordon Bruce has followed up his GT40 title with this high-quality treatise on the Shelby Cobras is, to this reviewer, entirely appropriate. This is because I first met Gordon in the paddock at the Christies International Historic Festival at Silverstone in 1990, where he was racing his own Cobra. Bruce brings skill and panache to the story of the AC/Shelby Cobra’s development, and makes a few skilled observations that were new to my knowledge – that the Shelby cars were based on the last 2.6 litre Ford-engine AC cars, for example and that without a doubt the first Cobra was made at AC Cars in Thames Ditton in the UK. It was shipped to the USA without an engine, and was given much of its preparation still wearing the AC badge on its nose – Carroll Shelby made certain that when the car met the press, it had a Shelby American badge attached and indeed, it is something of an issue that dogs Cobras to this very day, in fact. AC? Shelby? Ford? This is a superbly well put together book, with facts aplenty and a wonderful mix of period photography and some custom shot studio work; it will appeal to anyone with even a passing interest in Cobras, even if they are “fake-snake”/’replicars’. The changes from prototype to production versions are carefully and fastidiously documented and each change is discussed and given an in-depth analysis. Each of the three chassis put under the microscope here is given a full and thorough critique and tribute, covering period action and often nut and bolt restorations. It is all simply superb stuff. My only time quibble is the repeated assertion that Carroll Shelby achieved the “arguably unique treble of winning at Le Mans as a driver (1959) constructor (1964) and team manager (1966)”. The first and last of these I can agree with. However, his 1964 achievement was a Class Win and 4th place overall. A win, for certain, but not an overall win to rank with his Aston Martin and GT40 Triumphs, I most humbly suggest. Price: £30. 128 pages (235mm x 285mm), hardback.